Walk into the Skip and Cindy Hogan Tennis Center during a men’s tennis practice and you might think the U.N. changed location. Overheard languages include Danish, Dutch, Portuguese, Spanish, French, German and Italian with a little Farsi tossed into the mix. The Toreros have won five straight West Coast Conference Tournament championships, and the team is as diverse as it is talented. The No. 1 singles player, August Holmgren, built his all-court game in Denmark. 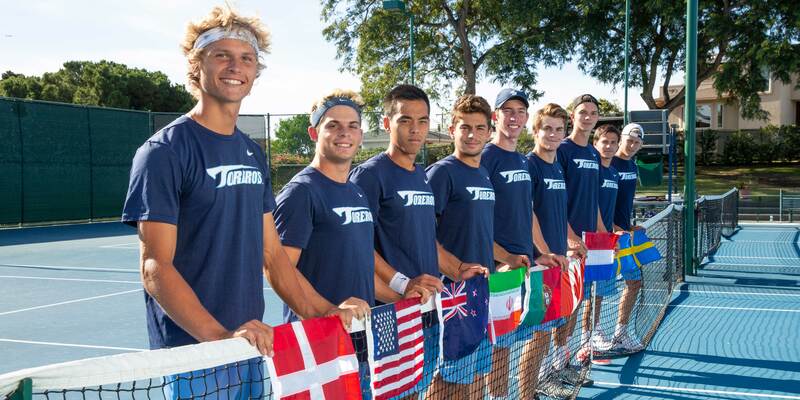 The Toreros’ top doubles team of Gui Osorio and Nico Borter hail from Portugal and Switzerland, respectively. There are two players from Sweden, one from Holland and another from New Zealand. First-year Armin Rostami was born in Iran. In all, eight of the nine players were born outside the United States. “It’s cool that we have so many different backgrounds,” says Osorio. The man who built this internationally-flavored team is USD head coach Ryan Keckley. Now in his fourth season as the Toreros’ head coach, Keckley recruits the United States hard, particularly the southwest and Pacific Northwest. But his goal is to build USD into one of the nation’s top 10 programs. To broaden the talent pool, he recruits globally, particularly in the Scandinavian region. “The cultures aren’t that different,” Keckley says. To find top international players, Keckley spends hours on the internet, identifying high-ranked players and tracking their results. Then Keckley and assistant coach Rich Bonfiglio contact players via social media and begin building relationships. “I just felt a connection every time I talked to the coaches,” says Holmgren. With players from such disparate backgrounds, Keckley works to build camaraderie. Miniature soccer balls are booted around at practice. Touch football games break out at beach outings. The players splatter each other during paintball trips. Keckley’s formula is working — on and off the court. Consider those five straight WCC Tournament titles. In October, sophomore Holmgren climbed to No. 30 in the NCAA Division I singles rankings. Osorio and Borter were ranked 10th in doubles. Academically, the team compiled a 3.08 GPA for the 2017-18 school year. Learning is also going on away from the court and outside of the classroom. Pratt Keerasuntonpong educated teammates about New Zealand’s dense sheep population. Borter told tales of Switzerland’s beautiful mountains.